Are you looking for top rated infant car seat covers? If so, you’ll want to keep a few things in mind. Car seat covers provide protection from the elements, filling in the spaces that a car seat canopy won’t reach, but that’s not their only benefit. Some covers are made for specific seasons. Some can be personalized with your child’s name or initials. They come in a wide array of colors and patterns to match your unique style. When your car seat is not in use, a cover can protect it from dust and sun damage. Not all car seat covers are created equal. Take the time to research reviews and product details so you find the best quality you can afford. When shopping for your infant car seat cover, think about what matters most in how you will use it. Will you need to remove it often? Do you frequently take long car trips? Do you have a high quality car seat that you want to protect? During which seasons will you need to use it most often? Help keep your child warm in the winter. Provide sun protection during the summer months, while preventing overheating. Protect from germs at public events. Provide a barrier in any weather conditions, including rain, snow, sleet and wind. Serve multiple purposes as nursing covers, changing pads, shopping cart & high chair covers, scarves, etc. The best car seat covers are made with high quality materials that won’t fade, tear, or weaken with regular use. Some are made with organic materials that won’t irritate a baby’s skin. Many families need more than one seat cover, including one for travel and one for everyday use or for additional children. Browse our reviews and decide which works best for your family’s needs and budget. This cover from JJ Cole comes in two sizes for baby or toddler. It looks like your classic baby bunting and is designed for use during the winter months. Available in an assortment of colors, the Bundleme fits most car seats, strollers and jogging strollers. 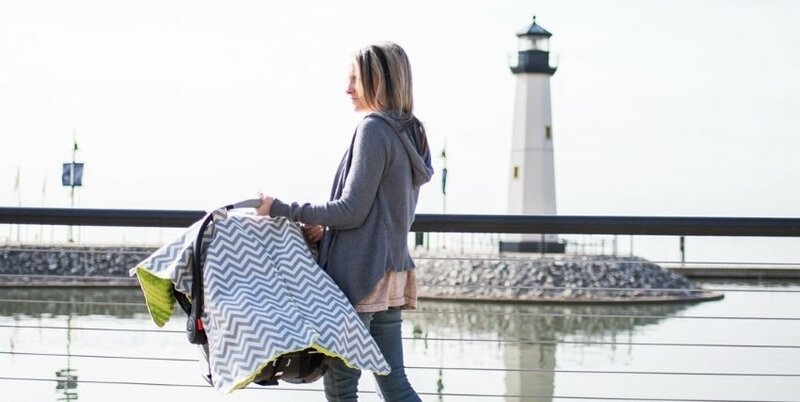 It’s better than a separate blanket that won’t get blown away with wind gusts, get caught in your stroller wheels, or worse yet, get lost. The quilted nylon shell repels wind and rain. Inside, there’s a thermaplush liner for extra warmth. The easy to remove top helps you adjust the temperature to prevent overheating. It’s also machine washable, which is always a plus for baby products. However, if you live in extreme northern climates that regularly experience below zero temperatures, this may not provide enough protection. Some parents noted that the zipper broke after a few uses. In some cases, the cover didn’t stay in place well and had to be readjusted often. The original doesn’t have a quilted nylon shell, so it won’t repel rain as well as the Urban. The polyester shell repels rain. Plus it comes in an additional teal color. This is one of several multi-functional covers on our list. 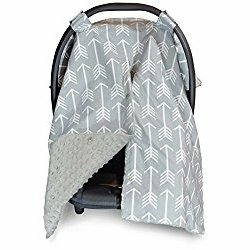 Besides providing a stretchy cover for your car seat, this product can be used as a breastfeeding cover, high chair or shopping cart cover, a light blanket, changing pad and even an infinity scarf. Besides the pink blush color, it comes in a mint color and a grey & white striped pattern. Unlike the previous cover, this one isn’t meant for winter. The material is a thinner, cotton spandex. It will provide sun and wind protection while remaining breathable for warm summer months. It won’t overheat your baby as a nursing cover either. Some moms loved that it could be worn as an infinity scarf as well so they didn’t need to take the nursing cover off while out and about. While most parents loved how it fit their car seat, one parent noted that there’s not much room left on the handle to carry the car seat, especially if you like to carry it on your forearm. A few nursing moms didn’t like the tighter fit when used as a nursing cover. 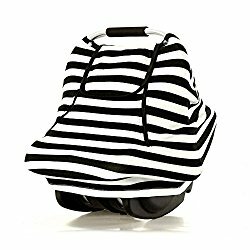 If you prefer a looser cover for your wiggly baby, it’s probably not great as a nursing cover, but as a car seat cover, it’s a fine choice. This cover from Busy Monkey is another multipurpose product. 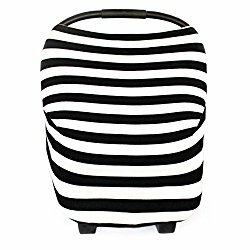 It’s designed for use as a car seat cover, canopy, high chair cover, nursing cover, changing pad, scarf, etc. The fabric is a stretchy rayon blend which is lightweight and breathable. While not suitable for winter, this makes another good warm weather cover. In the car, it can block the sun and cold air coming from your AC. We love that it’s machine washable. Moms found it roomy enough as a nursing cover. The opening was large enough for them to see the baby during feedings. They liked that it held up in the washing machine and didn’t wrinkle. It does need to be hung to dry, however. 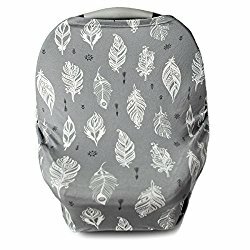 There weren’t any major issues with this cover, so if you want a multipurpose infant car seat cover for warm weather, this is a great option. The Copper Pearl car seat cover is another multipurpose cover. There are several colors and patterns available including “The Classic” with black and white stripes. Machine washable, fade-resistant and compact-folding fabric have made this cover a favorite among many parents. For use as a nursing cover, some moms of newborns didn’t like the narrow opening that blocked their view of the baby latching on. For older babies or more experienced moms, this may not be an issue. Some parents said they wished it came in more “boy” colors and patterns, as these tend to be floral and pastel in style. The biggest complaint was that the fabric didn’t hold up well after a few uses. Some stitching unraveled and holes formed. This was disappointing, however the brand does have a big following, and you should have no issues in returning it if necessary. 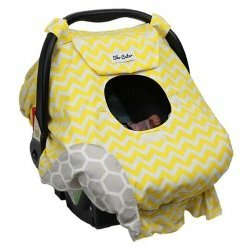 Another versatile car seat cover, this one from Kids N’ Such comes in a nice variety of patterns and colors that would work for girls or boys. The machine washable 95% rayon / 5% spandex fabric is stretchable and thin enough to provide good air flow. This one, like the previous multi-purpose covers, is best suited for warm weather, though it does a fine job of blocking chilly wind gusts. While not waterproof, it keeps baby dry for short periods in rainy weather. It keeps out other summer annoyances like mosquitoes, bees and prying eyes, so your baby can sleep undisturbed during a family picnic. 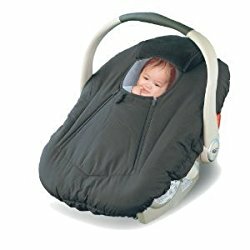 Moms liked the stretchy design that allows them to peek in on their babies without having to unzip or unfasten any flaps. They also love the all around coverage for nursing, particularly first time moms. If you prefer a looser cover for nursing, you may not like this one. Some moms said it fit too tight when trying to nurse with one arm out as you might do at a restaurant or while taking care of other children. Like the previous cover, some parents noted holes in the fabric after a short time using it. However, we were pleased to see so many reports of excellent customer service from the Kids N’ Such company. 100% money back guarantee. Be sure to contact the company directly with any issues. 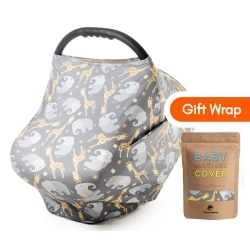 This all-season car seat cover from Sho Cute is a little different from the rest. While still dual-functioning as a nursing cover, this product is reversible so you can switch to an all new color/pattern without having to buy a second one. It also has toy loops so you can keep baby entertained while blocking out the sun and rain. There’s a “peek-a-boo” window accessible with a velcro-fastened flap, though some parents noted it didn’t line up with the baby’s face very well. It’s not insulated, so it’s not great for super cold weather conditions. But the double layer of 100% cotton will do a fine job of keeping the baby warm if you’re not going to be outdoors for long. As a nursing cover, this one is a bit lackluster. Instead of being a stretchy fabric, it’s tightened with a bungee-like cord. It’s rather short compared to the other multipurpose covers and the fabric isn’t stretchy, so it may not offer great coverage. If you like a loose nursing cover, however, this one could work well. The Jolly Jumper is a great choice for cold weather and northern climates. It’s insulated with a fleece liner. The outer nylon fabric is water resistant, and there’s a peekaboo window with a velcro fastener like the previous model. Though it does come in a variety of colors, some parents received the wrong color when ordering. If you don’t want to risk that, go for a neutral gray or black that will go with any car seat style. It is machine washable, but you’ll need to hang it to dry. Unlike the summer-friendly covers, these aren’t multipurpose, but aren’t designed to be. Some parents had issues with the zippers sticking. The biggest issue we noticed was that the fabric lay too close to the baby’s face in some instances. This could be due to car seat design, as other parents found the cover didn’t fit their particular car seat well. To be safe, contact the company or do some research to see if your car seat will work with this seat cover. 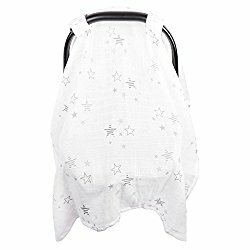 This is another car seat cover from Kids N’ Such that also works as a nursing cover, but it’s designed differently than most. It functions more like the classic blanket over the car seat, but attaches to the car seat handle with loop fasteners so it won’t blow away in windy conditions. It also keeps the cover off of your baby’s face, unlike a blanket. The opening is a long gap in the middle that fastens with snaps, but can offer a better view of your baby than a small peekaboo window when looking in on him. It’s also easier to get the baby in and out without removing the cover. While the inside fabric comes in different colors, the outer fabric is gray with a white arrow pattern. It’s not reversible, however, which is a bummer. But the loose-fit design provides a more universal fit for all types of infant car seats. There may be some quality control issues with this seat with snaps that malfunction or come off easily, loose seams and missing loop attachments. However, the company does have a 100% money-back guarantee, so be sure to contact them directly if you notice any problems. 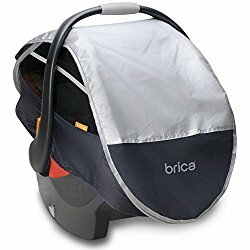 This car seat cover from Brica may be the most summer-friendly cover on our list. There’s a retractable sun shade that repels rain and is rated UPF 50+ to block UV rays. Under that is a mesh panel to provide 100% visibility and plenty of air while protecting them from mosquitoes and other insects. The mesh panel fastens with a zipper. The sun shade can be stored in a zippered pocket when not needed and fastens with a snap closure when used. While fantastic for keeping the bugs off your baby when you’re outdoors, several parents noted that the sun protection isn’t perfect. The sun shade doesn’t cover the sides well, so it will block sun directly overhead, but bright morning or evening sun can still reach the baby. Also, wind and rain could get through if it’s coming in sideways. Removing the baby with the cover on also might be a concern, as a few parents noted that the opening under the mesh isn’t big enough. If you’re going to be outdoors a lot, this is probably a good choice as it has better protection against summer sun and bugs than most covers. This cover from Amazlinen comes in one of two different fabric styles - thicker for winter and thinner for summer. There are 3 fabric colors/patterns to choose from, each of which would be great for either girls or boys. It’s another dual-function cover that can also serve as a nursing cover. Like the previous car seat, it comes with a mesh netting to keep away bugs, but is meant to be stretched over the entire cover and has no fasteners. Parents had no issues getting the baby in and out of the large zippered opening. As a nursing cover, it’s worked well for most moms. The biggest issue parents had once again was quality control. Some of the snap fasteners came off and in at least one instance, fell into the car seat with the baby, which can be a choking hazard. The company claims to have made recent improvements, but be sure to check all fasteners before use. If any are loose, contact the company immediately. For safety’s sake, remove it before you get in the car (as is recommended for many seat covers). 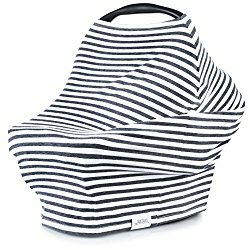 As the last multipurpose car seat cover on our list, this one from Jomolly is one of the largest on the market and comes with a carry bag, which most other models don’t include. The color/patterns are neutral gray and fine for boys or girls. The thin, 100% muslin cotton makes this best for warm weather use. Loop fasteners attach it to the infant carrier handle. If you like looser nursing covers, you’ll like this one, and since it’s bigger than most, it’ll provide more coverage. While machine washable, it should be hung to dry only, as some parents experienced shrinkage after they put the cover in the dryer. The biggest problem parents had was the loop fasteners were too big on some car seat handles, so the cover kept falling down. This could be a safety issue if it falls on the baby’s face, so this is one of those products you may want to test in a retail store with your car seat before you buy online. Do you really need an infant car seat cover? Like many baby products on the market, a car seat cover isn’t a necessity. Yet, it can improve the quality of your baby’s time in her car seat, especially outdoors. The natural world is full of fantastic things for your baby to experience. Being outdoors encourages language skills. Beyond the four walls of your home is a whole world full of sensory stimuli for your baby to learn. Wind, rain, rocks, sticks, puffy clouds scooting across the blue sky above – all of it promotes their desire to communicate and gives you a whole new arsenal of words to teach them. Playing outside boosts physical development. Children attain the majority of their motor skills before they’re 5 years old. Much of that happens during their first two months. Even young babies who can’t run and play can watch other children on the playground. This provides vital information that will help them get a head start on motor skills like running, climbing, jumping, throwing, etc. Outdoor experiences provide a foundation for learning. Varied environments promote better brain development by stimulating a child’s natural curiosity. They’ll wonder how birds and airplanes fly and why the leaves change color and fall. These are teaching opportunities as you help them understand the world around them. It helps them become adept at science and reading skills later on. Time outdoors promotes better sleep patterns. According to a 2004 study, babies who slept well by 13 weeks of age were those who spent twice the amount of time in the sunlight than those who didn’t sleep well. Being indoors under artificial light all day and night inhibits the natural Circadian rhythms that promote healthy sleep. Plus, the more baby sleeps through the night, the more sleep you’ll get too! More time outdoors could mean less time being sick. Keeping your baby inside a filtered-air, sterilized environment can do more harm than good. While you don’t want to take baby into crowds during flu season and let strangers cough all over her, being exposed to natural outdoor microbes can boost their immune system to protect against illnesses, allergies and asthma. Going outside is good for mom and dad too! Postpartum depression (the baby blues) can be a serious condition. Studies have shown that outdoor exercise can boost your mood, release tension and fight depression. Sunlight helps your body create vitamin D, which is a natural mood booster. Even just 20 minutes a day can improve your health and provide valuable bonding time with your child. While the outdoors is a wonderful place to be, there are some not-so-fantastic things your baby can be exposed to as well. 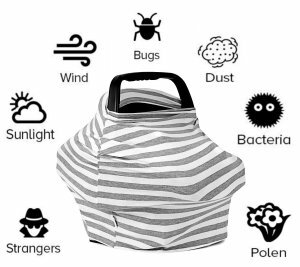 If you avoid going outdoors with your baby because of sun or rain, mosquitos, pollen or germs, investing in a good infant car seat cover can allow you both to get out more. Why are these things potentially harmful? Exposure to UV rays during an infant’s first 6 months (when their skin is most vulnerable), increases the risk of skin cancer later in life. This is especially true if children get sunburns. Cases of melanoma in young people are rising from the use of tanning beds and constant exposure to sun. Experts recommend avoiding direct sunlight when it’s most intense between 10 AM and 4 PM. An infant car seat cover with a UV blocking panel can help block out those rays if you do happen to be out at that time. If your baby is 6 months or older, a good sunscreen of at least 15 SPF and sun-blocking clothing can provide additional protection. Besides the annoying itchy bumps, mosquitoes can carry serious diseases that can be fatal, especially to the very young, very old or those with compromised immune systems. Among those common in the US are West Nile Virus and Zika Virus (which can also cause birth defects). In other countries, malaria, dengue, and yellow fever claim thousands of lives. Mosquitoes cause more deaths than any other organism, in fact. Over one million people die of mosquito-borne illness every day across the world. The main concern with rain, sleet, snow, etc. in babies is how it affects body temperature. Prolonged exposure (especially in winter) can lower a young infant’s body temperature very quickly, which can lead to hypothermia. Infant car seat covers can help repel precipitation, but very few are truly waterproof. In downpours or in rain that blows in sideways, it’s likely your baby will get wet if you’re outside for very long. A car seat cover will do a great job of keeping them dry for short periods, however. Young babies cannot regulate their body temperature as well as older children and adults. So it’s important to keep them warm in winter and cool in summer to avoid hypothermia and heat stroke. 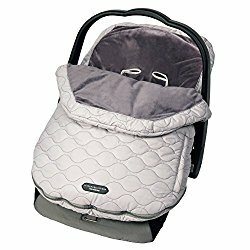 A fleece-lined infant car seat cover provides good insulation on those cold days while a breathable, sun-blocking cover can keep baby cool when the temperatures are high. Flu season can be a dangerous time for young children and infants since their immune systems aren’t fully developed. The flu season of 2017-18 was particularly deadly, even among older children and healthy adults. Avoiding crowded places with your baby is the best way to avoid exposing them to the flu virus. However, you can’t always avoid being in a crowd, so an infant car seat cover can block viruses transmitted through coughs and sneezes. It can also keep dirty hands away from your baby’s face. Even if they mean well, anyone touching your baby near her nose, mouth and eyes pose a real risk during flu season. There’s a reason most car seat cover manufacturers recommend taking off the cover before putting the car seat in the car. Many times, the cover can get between the seat bottom and the locking mechanism of the base so that the car seat won’t be fully secured, even if it seems to be. For safety’s sake, take off the cover before you get behind the wheel. For the many multipurpose covers on the market, consider investing in at least two. Use one for covering the seat and as a nursing cover and the other as a changing pad, high chair and shopping cart cover. This will lessen the chance of cross contamination for your child. Is the Bundleme waterproof or just resistant? The outer nylon hell does a good job of repelling rain and snow, but it’s not 100% waterproof if you’ll be outside for a long time in very rainy conditions. For a normal rainshower going to and from the car, or a quick stroll, it will do the job fine. I live in AZ. Which cover would keep my baby cooler? Look for the thinner fabrics like the stretchy rayon blends you’ll find with the Busy Monkey cover or the breathable mesh panels like the Brica Cover which has both UV protection and keeps insects away when you’re outdoors.